Commonly known as the 'Star Jasmine', Trachelospermum jasminoides is a popular, evergreen, ornamental climbing plants, noted for its profusion of highly scented, star-shaped blooms. Native to eastern and southeastern Asia, it has proven itself to be surprisingly hardy, and so long as it is positioned in full sun, and in a well-drained soil, it can be grown outside in the warmer regions of northern Europe without the need for winter protection. 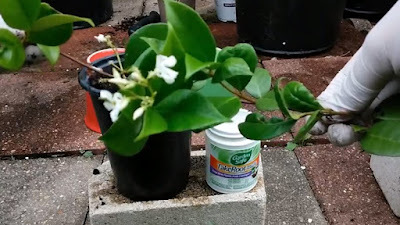 Successful propagation of Trachelospermum jasminoides is best achieved by taking semi-hardwood cuttings in summer. Water the parent plant the day before the cuttings are required to ensure that the subsequent plant material is suitably turgid. To reduce the risk of the cutting material of drying out before they have been struck, take your cuttings in the early morning, preferably on a cloudy day. Using a sharp, sterilized blade, cut a 30cm length of vigorous vine from a healthy star jasmine plant. Make the cut just below a node, which is the small swelling where a leaf or bud emerges. Without breaking the vine section, place inside a cool, damp bag or box and keep out of direct sunlight. Using 9 cm pots containing a well-drained, low-nutrient compost such as John Innes 'Seed and Cutting', prepare a single, deep hole in the middle using a dibber. Cut the vine section into 10 cm cuttings, again making your cut just below a node, taking care to identify the direction of growth so that you do not end up striking your cuttings upside down. Remove the leaves form the lower half of the cutting and dip the base in a rooting hormone powder. Being careful not to wipe the powder off, insert the cutting into the pre-drilled hole. Gently pack the compost around the cutting for support and gently water in. Place the pots inside a heated propagator at a temperature of approximately 18-22 degrees Celsius. Alternatively, place the pots inside a sealed, clear, polythene bag in a warm, bright position, but one which does not receive direct sunlight as this can dry out the compost and overheat the cutting causing it to also dry out. Keep the compost moist. but not waterlogged. You can expect rooting to take place in approximately 4 weeks. Once rooting has occurred, remove the cuttings from the propagator or polythene bag, and continue to grow on until the roots have established in the pot. At this point the cuttings can be potted on into 1 litre pots and hardened off outside in a bright, sheltered position, but again out of direct sunlight. 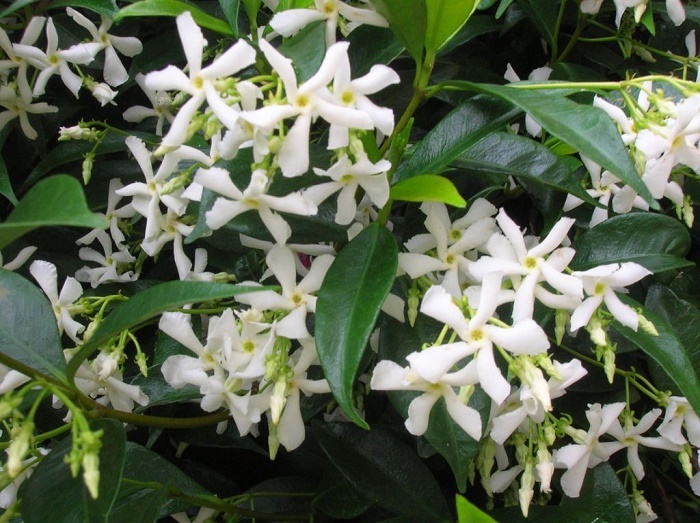 Your young Trachelospermum jasminoides plants will be ready for planting out into their final position come the following spring once all risk of late frosts have passed.